Mt. Al's Roundup, Inc. is a 501 (c) (3) not for profit tax exempt organization Tax ID # 81-0827431 and is the sponsor of the Greg Geiger Memorial Mt. Al’s Roundup, a private event held each year the weekend after Father's Day. The event will be held on June 22nd, 2019. Proceeds from the event and donations directly benefit The Heinzerling Community, which is dedicated to the care and development of individuals with disabilities. This event is designed to promote fellowship by way of shooting and camping. Participation by adolescent youth is encouraged. The day begins in Zanesville, Ohio at Briar Rabbit with a 50 bird round of team sporting clays ($10 buy in). We call it golf with a shot gun. Make certain that you sign up...this is very popular! You should bring your own gun, borrow one or you can rent one at Briar Rabbit. Camping at Briar Rabbit is required by all Directors and guests. 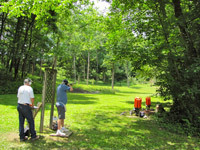 You need to bring a motor coach, pop-up camper or tent, any personal fire arm(s) you want to shoot at the Open Shoot. All activities begin at 12:30 sharp! At 6:30 we will have the awards and flag lowering ceremony followed by a steak and rib dinner prepared by the Camp Boss, Larry Clark and Made From Scratch. The evening features great live musical entertainment, an open bar and corn hole. Sunday morning offers a great cup of java, juice and a pastry before you make your way home to your family. Upon reflection, you realize that you had one of the most enjoyable times in a long long time. Your attendance and financial support are critical to making this event successful each year. After you're invited by your Director, please complete the online registration and pay online. Checks should be made payable to The Greg Geiger Memorial Mt. Al's Roundup. $135 Roundup only. $190 Roundup and Sporting Clays. $320 American Sniper is an upgrade that allows you to shoot full magazines and sub machine guns! Additional donations are encouraged and appreciated. If you can’t attend, a Donation will be graciously accepted for your absence. (Check with your employer regarding matching charitable contributions or speak with a Director regarding this opportunity). A letter acknowledging the tax deductible portion of your contribution will be sent to you at a later date. 2019 Reverse Raffle- Only 150 Tickets are sold. Tickets are drawn down to 5 finalist, then one to determine the winner! Tickets for the gun raffle are now available for $50.00 each, use the button below to purchase online via PayPal. For more information, click here.